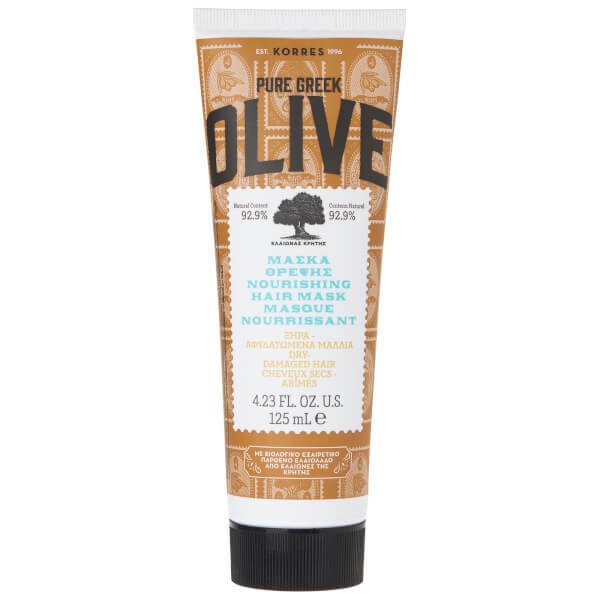 Replenish dry hair with the Korres Natural Pure Greek Olive Nourishing Hair Mask for Dry/Damaged Hair, a deeply revitalising hair masque inspired by the centuries old beauty rituals of Cretan women. Forming part of the Pure Greek Olive collection, the nourishing hair mask contains Extra Virgin Olive Oil (a natural source of antioxidants) and cold-pressed Olive Leaf extract from Crete's famous Koroneiki Olive tree groves. Brimming with Vitamins B and E, plus nourishing Wheat Proteins, the silicone-free hair treatment deeply moisturises while reviving radiance, elasticity and softness. Free from mineral oil, petrolatum/ paraffin wax, silicones, parabens, propylene glycol, ethanolamines, SLES, ALES, synthetic dye, phthalates, polycyclic musks and animal by products. Not tested on animals. Apply the mask to damp hair after shampooing and massage gently, leave for 3-5 minutes and rinse thoroughly. Repeat 1-2 times a week.